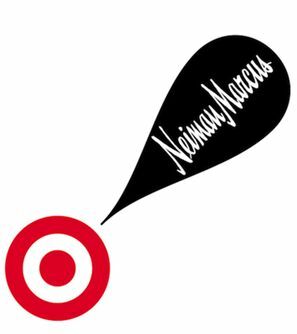 Here are my thoughts on one of the most anticipated collaboration of the holiday season between NM and Target. Alice + Olivia Bike... pass... With $500 price tag, you can be sure it's heading to the sale bin at Target. If that bike had Gucci or Fendi logo, people will likely snap it up. But everyday flower patterns? Not so much. Alice + Olivia luggage... pass... look cheap in the picture and uninspiring. Altuzarra drink collection. Ding ding ding. The tray actually looks expensive. Band of Outsiders cookie cutters. Kinda cute. Will pick up if I see them at sale end cap at Target. Band of Outsiders hats. Again, ok kinda cute. Will pick up if I see them in sale end cap. Brian Atwood glove. I can see this as a more special item for ladies. Brian Atwood sunglasses remind me of the ones Penny Marshall wears. Carolina Herrera Stationery Set, I can see this set do well at Target. Good price point and fun pattern. Carolina Herrera Travel Bag, again, I can see this set do well at Target. Derek Lam Skate Board. It's one of those what was he thinking??? But I want it because it'll look great on a wall in a loft or a teenage boy's room! Derek Lam Slippers. Not a stand out but may be a cute gift. DVF Jewelry Box. Not a great deal I would say but may be a useful thing to have. Hope to pick one up from the sale end cap. DVF Yoga Mat. I can see lots of ladies going for this. With a typical yoga mat selling for $20-$30, a DVF one at $50 isn't a huge stretch. Eddie Borgo stuff. Who is this guy again? Most people don't know him. Look for his stuff at the sale end cap at Target. Jason Wu girl dresses. They do look cute and has Jason's sensibility. I can see it sell well at NM. Maybe not at Target because price point isn't low enough. Jason Wu Ornaments. Again, this is a high price point for Target. They are actually quite pretty and cheap when compare to typical NM ornaments. I suspect lots of broken ones at Target sale end cap. Judith Leiber Compact Mirror. Again, price point isn't very Target consumer friendly. I suspect it'll be a great gift stuffer for typical NM shopper but not very touchable at Target. They will do well in the sale end cap though. Both Lela Rose's clothes are lovely. However, I'm worry that the doily top may ended up looking cheap and fall apart easily. Again, I predict you'll find her stuff at the sale end cap. Not big enough name to be purchased at full price. Both items from Marc Jacobs will do well. They are nothing to write home about. However, because it's MJ and stamp prominently on the items so they will sell. I'm very impressed with Marchesa's girl dresses. Especially the fuchsia one. I predict they will fly out the door especially at NM. Oscar de la Renta's pet stuff are not that inspiring but people will buy them because people LOVE their dogs and price is reasonable. Oscar de la Renta's tote bag is at a sweet spot for Target consumer. It will fly out of the store for sure. Say $129 on Ebay? Who is Philip Crangi? Majority of Americans don't know him. Prices are high for both items. Target's sale end cap they go! Prabal Gurung's both items are priced well and have a girly girl look to them. I think they will sell reasonably well at Target. Both Proenza Schouler's stuff will do well. I actually think the print works quite nicely on the ipad sleeve. Very artistic. Low price point will mean they will sell quite well at Target. I think Rag and Bone's cardigan will do well. Price point is not too high. Flask and shot glasses are good gift giving price point. They are one of those things you wouldn't necessarily buy but if someone give that to you as a gift, you are happy to receive them. Robert Rodriguez. Both items for ladies will do well. It's very put together and has a good look to it. They will sell out. Unfortunately Rodarte also made an ornament for Target like Jason Wu. All I have to say is Jason has Rodarte beat. Rodarte wrapping paper is at a great price point. It's one of those thing you pick up without thinking how much it cost since it's under $10. Skaist-Taylor kid's hat is just plain weird. Great for Halloween costume but other than that, who would wear that? Sale end cap. Skaist-Taylor vest. I'm not a big fan of fake fur because it looks and feels... fake. However, at $80 price point, I can see people picking this up at full price. I've been wanting to pick up this Thom Browne type of jacket for the longest time so I'll definitely buy one. As for the price point, sold out at NM, not so much at Target. May be gone from the get go but you will see returns at Target especially after Christmas. Same with women's version. Both items from Tory Burch graphically pop compare to other offerings. With low price point, they will be gone in a NY minute. I really do like Tracy Reese's plates. They are good holiday fun. I'll definitely pick them up. I think at that price point, it makes a good holiday gift to someone special. Tracy Reese's blouse looked good on the model on GMA. Who knows how well it will translates on a normal body? May look grandma-ish if not pair with the correct pants and shoes.